Floral City is what Florida natives lovingly call “Old Florida”. It is all that is naturally beautiful in the Sunshine State with a majestic moss draped tree canopy—The Avenue of the Oaks—dramatically signaling your arrival. The period-houses that line East Orange Avenue still give the feel of a turn of the 20th Century community. Walk past the wrought iron fences and blooming azaleas and you are welcomed back to an earlier time. Floral City was briefly larger than Miami during a phosphate mining boom in the late 1900’s. Each year on the first weekend in December, the town turns back the clock to kick off the holiday season with “illuminations” and horse-drawn carriage rides during Floral City Heritage Days. The Floral City Heritage Museum and Country Store in the community’s old fire house, preserves that history year round. Old and new easily intermingle here. The new library next door to the museum is thoroughly up to date. The Withlacoochee State Trail, Florida’s longest paved recreation trail, sprinkles the town center with spandex-clad visitors enjoying a weekend cycling getaway. Life moves at an easy natural pace as people duck in and out of restaurants, shops and galleries exploring things as new as the latest line of bicycles to things as time honored as a real small town hardware store. 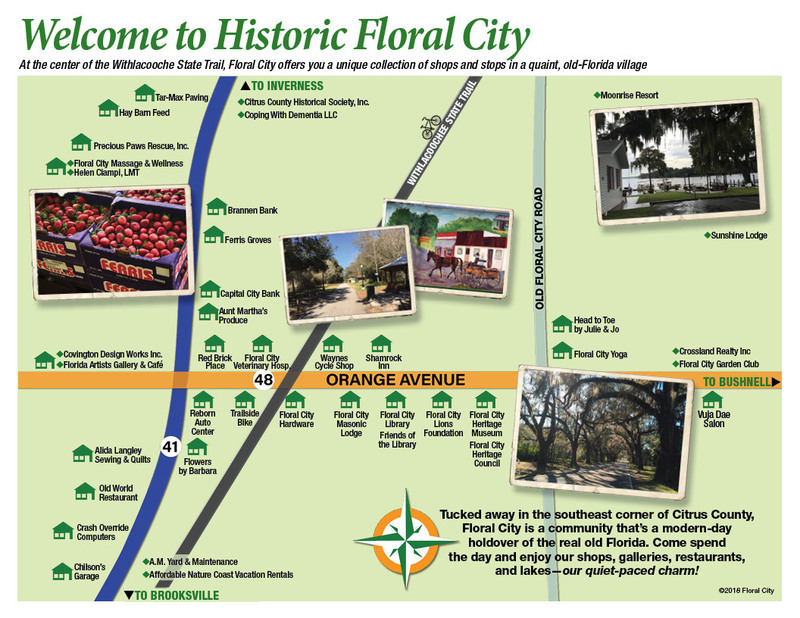 What defines Floral City is what once defined much of Florida. There was a time when the bounty of Florida was proudly displayed along roadsides throughout the state. Fresh fruit and vegetable stands are still prominent here. Ferris Groves, one of Florida’s most beloved retro fruit stands, welcomes guests with a cheery orange and white striped tent-style canopy that has hardly changed in fifty years. Just down the street other fruit and vegetable stands also display the latest Florida grown produce and treasured regional classics like boiled peanuts. The most popular festival of the year, by far, is the Floral City Strawberry Festival in early March. It’s worth the trip to just to taste the Strawberry Shortcake. You can even stay in a comfy cabin at one of two old fish-camp style resorts on Floral City Lake. Experience Old Florida. Experience Floral City.